Andy trained at Barnsley College before moving to Scotland and starting his professional career at the renowned 5 star, 3 AA Rosette Turnberry Hotel. A stint in London working at Restaurant Gordon Ramsay on Royal Hospital Road followed before Northern homesickness moved him to the 2AA Rosette Woodhall Hotel and Spa! Andy eventually followed his dad to the Yorkshire coast and they have worked together for a number of years. This latest collaboration is a role reversal as it sees Andy in charge. Originally from Barnsley, Bob trained at Catering College in Sheffield. With over 30 years of culinary experience, he brings a dynamic and innovative energy to the team. 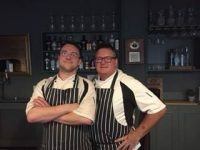 The White Horse and Griffin have developed a reputation for outstanding food, served in a relaxed and unfussy style, with an emphasis on locally sourced fresh seafood. Bob has joined a passionate team and is working closely alongside his son Andy. Bob brings a wealth of experience in fine dining working at all levels up to and including 3 AA Rosette. This will be a new experience for him, given that this time, Andy is in charge!